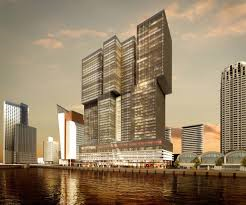 The “it” was a long-awaited complex of shops, housing, hotels and eateries developed for Parcel Q, the site opposite the hall on Grand Avenue, by Related Companies. Gehry’s office had designed a scheme for Related several years ago that evaporated in the recession; the latest, a preliminary plan by A.M. Stern and Gensler, was rejected by an oversight committee helmed by Supervisor Gloria Molina. 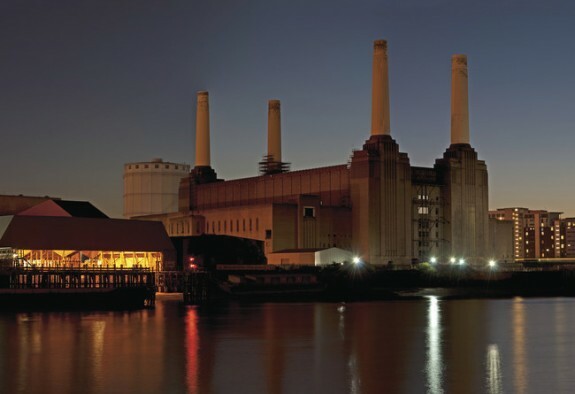 Now the incorrigible 80-something architect (also working on new overseas offices for Facebook and recently partnered up with Sir Norman Foster on a redevelopment of London’s beloved Battersea Power Station, below) and his talented partners have delivered a new proposal that faces Molina’s committee Monday. But, to the extent it is possible, Gehry is among those more adept at reducing the scale and humanizing large commercial complexes, perhaps because underlying his outwardly idiosyncratic work is a classical sense of order and proportion. For the architect, this project represents a long-awaited chance to essentially complete his Walt Disney Concert Hall, opening it up towards an attraction with “terraces, restaurant patios and pool decks, many of them generously landscaped” that would cascade down the hill with what appears to be Baroque theatricality. At the KCRW/LA Phil discussion about Grand Avenue, LA Phil president Deborah Borda emphasized that the Related development on the opposite side of the road be “aesthetically and intellectually” compatible with the concert hall. Maybe this will be the entertainment destination that achieves that, assuming it made Gloria Molina “happy” Monday.